Last time I was in Las Vegas I had a discussion with a friend, and then again with my mother when I returned, about whether or not Las Vegas is a place for everyone. I love Vegas, I think it’s a great thrill all around, and I contend that it really is a place just about anyone can have fun. Can kids have fun in Las Vegas? Certainly. Obviously the trip is not going to be a gambling one, or a nightlife one, but that’s okay. I think people underestimate how much kids loves looking at big, flashy, grandiose things; think about how much most kids love trucks and skyscrapers and big bird. These large things seem even more massive through the eyes of a child. Depending on who you bring with you, it’s still possible to get in some gambling or other adult activities. Maybe you go with another couple and take turns baby-sitting, or bring the grandparents. Maybe one parent takes the kids to dinner while the other spends a couple of hours at the poker table. There’s plenty of areas to compromise to accomplish everything you want to do while you’re out there. Translate that to the over-indulgent culture of Las Vegas and you get plenty of sights to see that kids will get a kick out of. 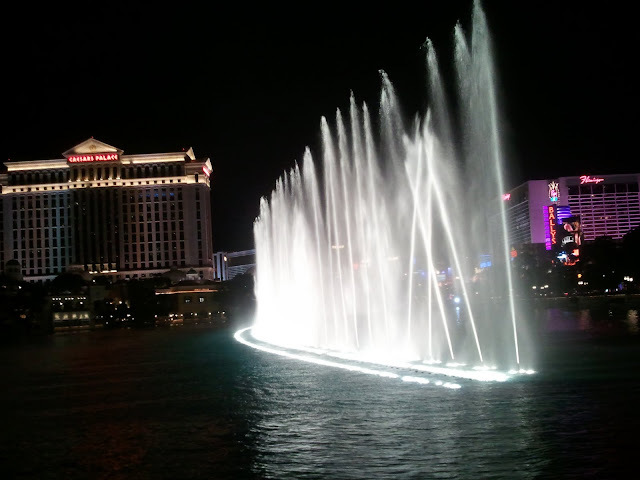 The fountains at the Bellagio or the Volcano at the Mirage. The half-size Eiffel Tower or the soon to be built observation wheels. Giant chocolate fountains, amazingly decorated lobbies, expansive buffet tables, flashy neon lights, characters from movies and cartoons on every corner, and pirate shows. That’s all without even mentioning the dozens of kid-friendly shows from Cirque Du Soleil to Penn and Teller. You can’t forget the day trips either. There are bus trips if you don’t feel like driving, but Las Vegas is within reach of Death Valley, The Hoover Dam, and the Grand Canyon. All three places are family friendly locations and landmarks worth seeing. They contain historical and cultural value but are also cool places to visit. There are other interesting places as well closer to the strip like Red Rock Canyon, and Siegfried & Roy’s Secret Garden and Dolphin Habitat. There are art galleries and museums all over the place. Kids can certainly have fun in Las Vegas, and Las Vegas has things to offer beyond what it’s typically known for. Don’t let kids keep you from a Vegas vacation if that’s what you have your heart set on. There are plenty of opportunities for a child to have a very memorable vacation there. Here’s a link I saw about beer ice cream. It’s the perfect summer treat. There are a couple of professional pints, but also some tips to do it yourself. None of the places mentioned are local to New York or New Jersey, but I’m sure someone out there must be mixing beer and ice cream this summer. I’ve got an ice cream maker, so this is definitely something I’m going to give a try at one point this summer. One thing I do like to do is use beer in milkshakes. Adding a nice rich stout to some ice cream (And some whiskey if you like) makes a delicious treat. The roasted, bitter taste of the beer goes very well with the sweet cream. It’s like an Irish Car Bomb Milk Shake. Adding Bailey’s seems redundant here since it’s basically cream and whiskey, but feel free to add it in if you feel like it’s not a true car bomb without.